February is the month of love and friendship, and we at SWAT Nation will bring you our next SWAT Tourney! 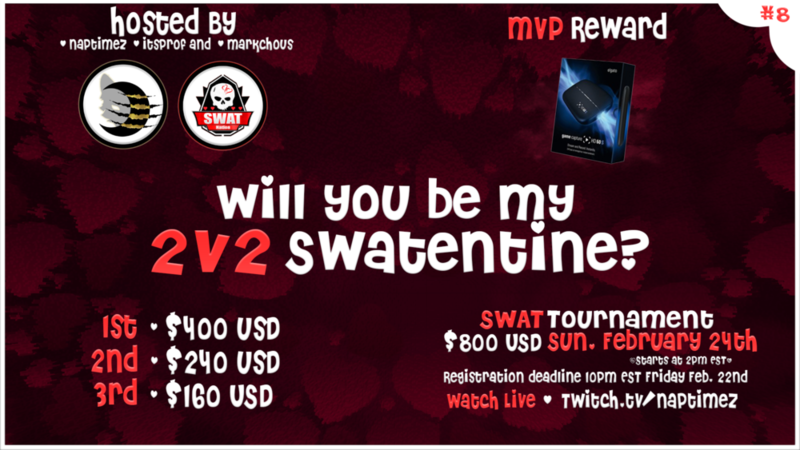 @itsprof, @markchous, and myself will be co-hosting Will You Be My 2v2 SWATentine?, a 2v2 tourney where you’ll choose your best half and take it to the arena. Let the fires of SWAT kindle the love of this season. Teams will compete for their piece of a $800 USD prize pool. @markchous is also rewarding an Elgato Game Capture HD 60 S to the MVP of the tournament! The tourney will take place Sunday, February 24th 2019 at 2pm EDT. Registration deadline is Friday, February 22nd 2019 at 10pm EDT. Bracket will also be posted at this time on stream at twitch.tv/NapTimez. You can sign up at the bottom of this page. Enter your 2 team members along with your team name.